Having a cesarean can be a frightening ordeal and getting your body back after the incision is made is a whole other story. During postpartum recovery, many women find it difficult to start exercise after a C-section. The pain and discomfort in the mid-section can be daunting. However, studies show the quicker you get up and walk and start moving, the better off you will be. This post may contain affiliate links. This means if you click a link, i may earn a small commission at no extra cost to you. You can read our full disclosure here. When Can You Start Exercising After a C Section? It depends… It really depends on what types of exercise you have in mind. Ultimately, you can start exercising after a c section when your doctor has given you the all clear. Usually, they even have your stand and walk within hours of surgery. This may seem crazy and even a little cruel… but early movement and exercise has been proven to help to women around the globe recover faster. But, before you start exercising after a cesarian make sure your body is ready to workout after baby and that you keep a realistic time line in mind. Here is our suggestion on a general timeline to follow after your surgery. The first few days after your c-section you may feel tired, stressed and in some discomfort from the healing process. It is important to take it easy and not try to over do it. Your doctors will want to see you walking and moving, but just be cautious not to go too wild. Your body needs some time to recover. Pssst…If you haven’t check out The Postpartum Cure, I highly recommend it! It’s one of the best postpartum recovery programs out there. Many of my readers have tried it and they are loving it! Just watch her intro video. I know I related to all the same struggles, and I bet you’ll relate to a few too! Your doctor or healthcare provider may encourage you to begin with light exercise after your c-section. Usually this is as simple as walking and light stretching! This will help speed up your healing and get you feeling better, quicker. When you walk, it helps your circulatory system, your muscles and your spirit. Even these light exercises can give you those feel good endorphins. Another thing to note is your posture. Many new moms get stuck in a stooping posture after a c-section. It’s normal to try to safe gaurd your tummy due to the pain and fear of something happening, but avoid getting into this habit. Be aware of your posture and try to remind yourself to stand up straight as often as possible. The bad posture not only leads to back pain, but can cause problems with your abdominal muscles as you start to heal postpartum. You may be feeling a little feisty and ready to get back to the grind at this point. It is common for moms to get a little stir crazy and want to get their pre-pregnant body back. This is a good feeling, however, temper that with moderation. Remember, your body just went through a lot of work and trauma, so don’t go too fast. This is a good time to start doing pelvic floor exercises, light walking for cardio and even some light yoga poses to regain your center of balance. Remember, your joints and ligaments will be soft for up to five months postpartum (due to pregnancy hormones) so step carefully to ensure you don’t fall or injure your knees! Now is the time when many moms get into a groove with their newborn. If you have other kids on the ground, you may feel overwhelmed and a little tired. But, keep up with your walking routine and pelvic floor exercises. This will support you when you get the all-clear from your doctor to do more exercise. Now is a good time to push a stroller if you like and walk a little farther than before. Continue to do your pelvic floor exercises and work toward doing some yoga stretches. Make sure to warm up and stretch before your walks. You may feel very tired after only a few minutes of walking, but each day you should feel a little stronger, and able to go a little further before feeling this way. Some women experience diastasis recti, which is a separation of the abs, following a cesarean. This can cause pain in the lower back and pelvic region. There are certain exercises to avoid such as sit-ups, planks and straight-leg raises as it could worsen any diastasis recti. Don’t be alarmed, as this can usually be treated with rehabilitative exercise and time. Before starting any type of exercise after a c-section, check with your doctor. They may recommend waiting until you are 4-6 months after surgery to do any type of abdominal exercises. Working out after a cesarean can be very rewarding for new moms. Getting to reconnect with your core and center of gravity can be challenging so take your time and enjoy the journey. Make sure if you have any questions about what you can and can’t do to consult with your doctor or healthcare professional so that you are gentle on your body. As the weeks go by, you will start to get your body back in a matter of time. 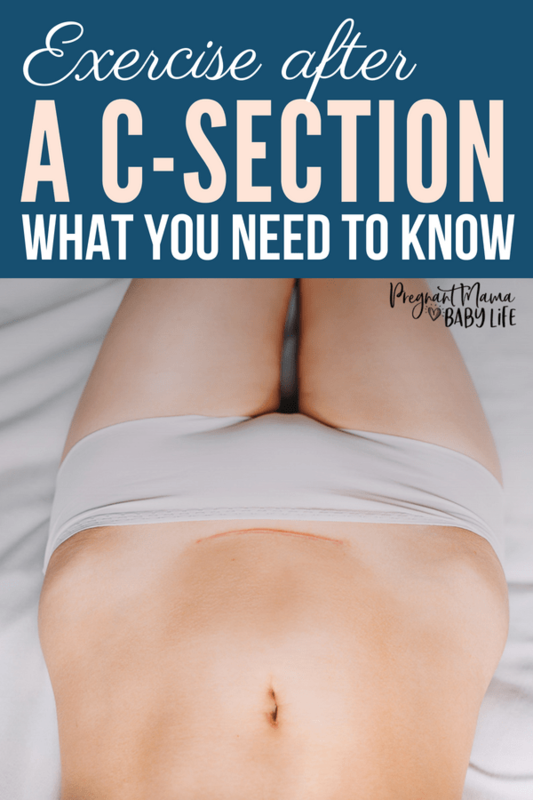 There are a few preferable light exercises you can do after your c section. Starting with walking and gentle stretches. Then, once your doctor okays more exercise you can start with these fantastic postpartum workouts. Here is a great pelvic floor exercise routine that is a perfect place to start when you decide you’re ready to start exercising again after your cesarian. Strengthening your pelvic floor with help get you feeling back to your old self sooner. Here are other good exercises to start 2-4 weeks post c section. Here is another fantastic routine new moms can do (once cleared by your MD of course) 4-6 weeks after your c-section surgery. If you’re serious about healing your body after your baby is born, you will want to check out this course called The Postpartum Cure. It is AMAZING. When I heard about it, I just had to check it out. I didn’t have high expectations for this class, but I was so wrong. Katie, who created this course, had a very real struggle postpartum too. She will help you figure out how to regain your core strength, fix your pelvic floor, what you should eat to heal faster and even how to hold your baby and fix your posture so your not damaging your body worse postpartum. She also has recipes, printable grocery lists and gives you tips to make the process as easy as possible! You can check out the program here and regain your strength back quicker after pregnancy. Is Your Body Ready to Work out Postpartum? Stormy is a mother of three, two of whom she grew herself. She's a registered nurse turned work at home mom who strongly enjoys coffee and reruns of The Office. I’m Stormy. Welcome to Pregnant Mama Baby Life. Being a new mom isn’t easy. Here you’ll find tips to make it simpler and less frustrating. Sign up for our weekly pregnancy to-dos, baby facts and pics, and lots of printables and discounts on the best baby items! Pregnant Mama Baby Life is a participant in the Amazon Services LLC Associates Program, an affiliate advertising program designed to provide a means for sites to earn advertising fees by advertising and linking to Amazon.com Amazon and the Amazon logo are trademarks of Amazon.com, Inc. or its affiliates. All information found on pregnantmamababylife.com is intended for informational and educational purposes only. The information provided on this website is not intended to be a replacement or substitute for professional medical advice. Pregnant Mama ­Baby Life Copyright © 2019.